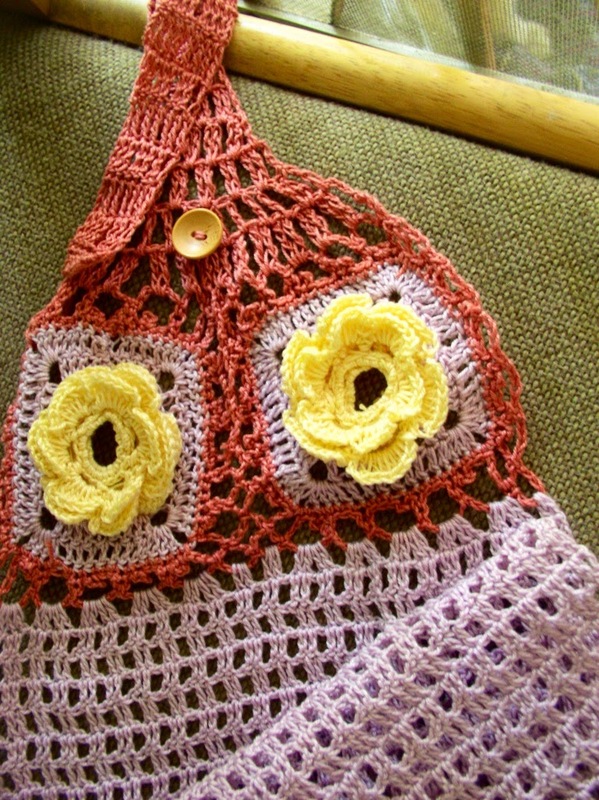 Lovely rose square motifs liven up this crocheted Tea Towel – a practical and all-season gift for family and friends. 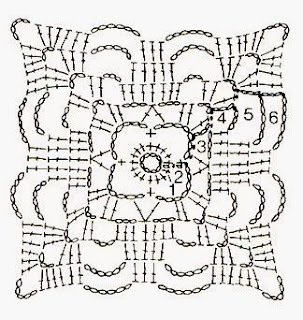 Design notes: The Tea Towel is crocheted starting with the Rose Square Motifs made in the round, which are join-as-you-go motifs. 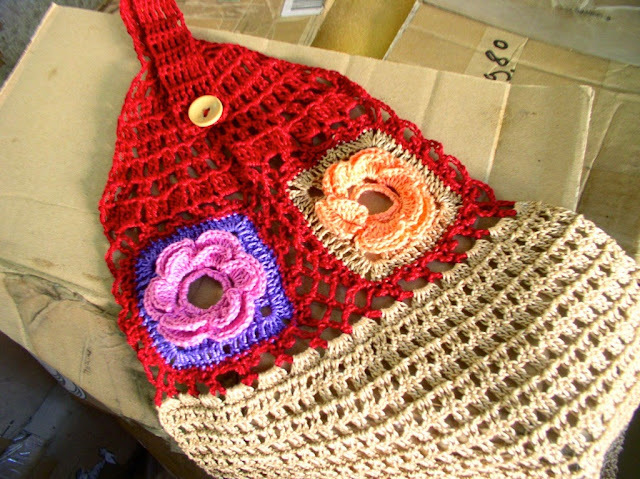 Alternatively, you can crochet the two motifs separately and then sew them together by hand. Two extra flowers are made and sewn on the back side of the motifs (also optional). The strap is made in rows, and finally, the towel, also in rows. The button is sewn by hand. Space in the treble stitch of the strap should be of sufficient size to serve as buttonhole. (Above photo) Here is another version of the Tea Towel, using colors: burgundy, beige, pale orange, pink and blue-violet. If you would like a tougher towel, you can use this pattern with two strands of cotton thread. Using pale yellow thread, ch 12. Sl st in first ch to join into a ring. Rnd 1: Ch 1, 18 sc in ring, sl st to first sc to join. Rnd 2: Ch 1, sc in same sc, *ch 3, sk 2 sc, sc in next sc, rep from * all around, ending with sl st in first sc. (6 ch-3 loops made). Rnd 3: Ch 1, sc in same sc, [sc in ch-3 loop, ch 3, 5 dc in ch-3 loop, ch 3, sc in ch-3 loop] in all 6 ch-3 loops, end with sl st in first sc. (6 petals made). Rnd 4: Ch 1, working behind the petals, *sc between 2 sc between two petals, ch 5, rep from * all around ending with sl st in first sc. (6 ch-5 loops made). Rnd 5: Ch 1, [sc in ch-5 loop, ch 3, 7 dc in ch-5 loop, ch 3, sc in ch-5 loop] in all 6 ch-5 loops, end with sl st in first sc. Fasten off. Rnd 6: Using lavender thread and working behind the petals, join with sc between 2 sc, [ch 6, sc between next 2 sc] 6 times, omitting sc in last rep; sl st in first sc. Rnd 7: Sl st into next ch, ch 3 (count as 1 dc), *[4 dc, ch 2, 1 dc] in same ch-6 loop, 6 dc in next ch-6 loop, [2 dc, ch 2, 4 dc] in next ch-6 loop **, 1 dc into next ch-6 loop; rep from * to **, sl st in top of ch-3. 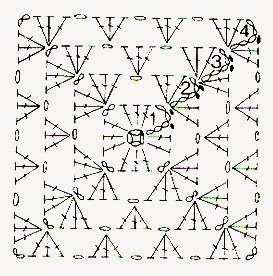 Rnd 8: Ch 3 (count as 1 dc), dc in each dc all around with [3 dc, ch 2, 3 dc] in each ch-2 sp in the corner of the motif, end with sl st in top of ch-3. Fasten off. Rnd 9: Using mauve color thread, join with sl st into same place, ch 1, sc in same st, *sc into next st, make ch-3 picot of [ch 3, sl st in top of last sc made, sc in next st] two times, 1 sc in each of next 2 sts, make [ch-3 picot, sc in next st] two times, [sc, ch 7, sc] into corner ch-2 sp, sc into next st, [ch-3 picot, sc in next st] two times, 1 sc into each of next 2 sts, [ch-3 picot, sc in next st] two times, sc into next st; rep from * 3 times omitting sc at end of last rep; sl st in first sc. Rnd 10: Sl st to tip of first picot, ch 1, sc in same picot, *ch 5, skip next picot, sc in next picot, ch 5, [sc, ch 7, sc] in corner ch-7 loop, [ch 5, skip next picot, sc into next picot] two times, ch 5, sc into next picot; rep from * three times omitting sc at end of last rep, sl st in first sc. Fasten off. Follow instruction for rnds 1-9. Rnd 10 joins the second motif to the first motif. 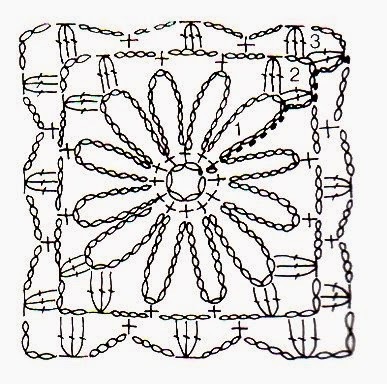 If you have difficulty in this section, you can crochet the two motifs separately and then sew them together by hand. Rnd 10: Sl st to tip of first picot, ch 1, sc in same picot, ch 5, sk next picot, sc in next picot, ch 5, sc in ch-7 loop, ch 3, sc in ch-7 loop of first motif, ch 3, sc in ch-7 loop of second motif, ch 2, sc in ch-5 loop of first motif, ch 2, sk next picot, sc in next picot, ch 2, sc in second ch-5 loop of first motif, ch 2, sk next picot, sc in next picot, ch 2, sc in third ch-5 loop of first motif, ch 2, sc in next picot, ch 2, sc in fourth ch-5 loop of first motif, ch 2, sk next picot, sc in next picot, ch 2, sc in fifth ch-5 loop of first motif, ch 2, sc in ch-7 loop, ch 3, sc in ch-7 loop of first motif, ch 3, sc in ch-7 loop of second motif, *ch 5, sk next picot, sc in next picot, ch 5, sk next picot, sc in next picot, ch 5, sc in next picot, ch 5, sk next picot, sc in next picot, ch 5, sk next picot, sc in ch-7 loop, ch 7, sc in same loop, rep from *, ch 5, sk next picot, sc in next picot, ch 5, sk next picot, sc in next picot, ch 5, sl st in first sc. Fasten off. 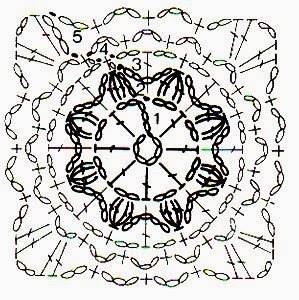 Using pale yellow thread, make two more flowers following rnds 1-5. 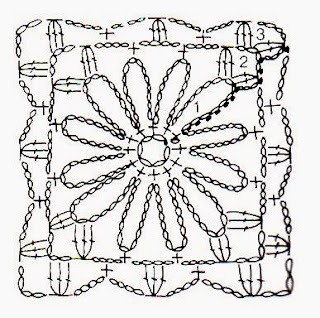 Sew the two flowers to opposite side of the motifs. Using mauve color thread, attach with sl st to corner ch-7 loop. Row 1: Ch 4 (count as 1 tr here and throughout), 3 tr in same loop, 4 tr in each of the remaining 13 loops across. Ch 4, turn. Row 2: 1 tr in next tr, 2 tr in gap after next 2 tr, *2 tr in gap after next 4 tr, rep fr * until you have 4 tr left; sk 2 tr, 1 tr in each of last 2 tr. Ch 4, turn. Row 3-6: Sk 3 tr, 2 tr in gap after every 2 tr until you have 3 tr left, end with 1 tr in top of last ch-4. Ch 4, turn. Row 7-8: Sk 3 tr, 2 tr in gap, 1 tr in gap after every 2 tr until you have 5 tr left, sk 2 tr, 2 tr in gap, sk 2 tr, 1 tr in top of last ch-4. Ch 4, turn. Row 9: Sk 3 tr, 2 tr in gap, [sk 1 tr, 1 tr in gap] twice, sk 1 tr, 2 tr in gap, 1 tr in top of last ch-4 (8 tr made). Ch 4, turn. Row 10-21: 1 tr in each tr. Ch 4, turn. In last rep, omit ch 4; ch 1, turn. Row 22: Sc in each tr across. Fasten off. With lavender thread, join with sl st to corner ch-7 loop. Row 1: Ch 3 (count as 1 dc here and throughout), 4 dc in same loop, 5 dc in each of the remaining 13 loops across. Ch 3, turn. Row 2: Dc in next dc, *ch 1, sk 1 dc, dc in next 2 dc, ch 1, dc in next 2 dc, rep from * to end; ch 3 turn. Row 35: Sc in each st across. Fasten off. With matching thread and yarn needle, sew button to row 4 of the strap. The gaps in tr st of strap should easily serve as buttonhole. Tea Towels (also serve as Hand Towels) are such simple useful things. I’ve noticed that the types with button-on straps (so you could hand them on the refrigerator handle or the kitchen door knob) have become the most popular in Manila and in Baclayon, Bohol. In our last stay at her home, I saw that Neria bought one and we all used it a lot. Two months ago I bought one for our kitchen and have found it very useful indeed! 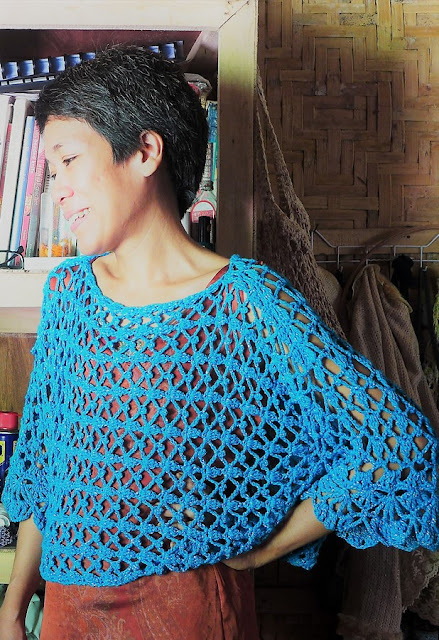 So I made two crocheted tea towels during my stay in our Baclayon home. I wanted to write the pattern for it but there was just too many things getting in the way. Now that I’m trying to get myself out of deathly boredom, I am making new tea towels and I would like to share the process of designing and making them. Crochetology problem: Consider the three sections of a Tea Towel – main section (for drying hands/plates), upper section (the section that connects the main section to the strap), the strap (so the Tea Towel could be hang unto a hook, door knob or beam), and the bottom edging (optional, as a decorative feature as well as a means to keep the Tea Towel from scrunching at the bottom). Use a granny square pattern to make a Tea Towel. 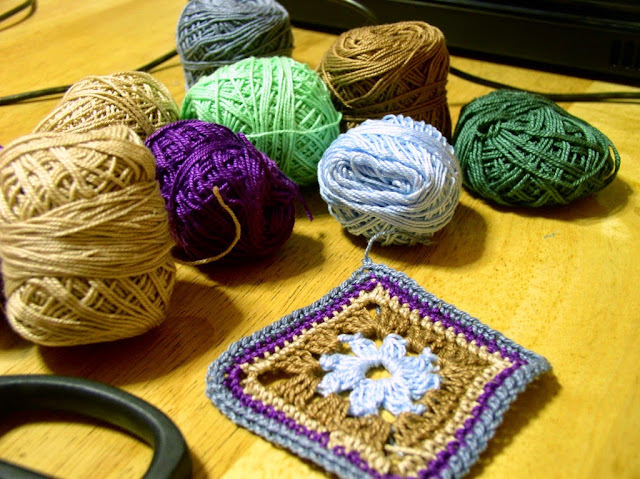 Look for a granny square that can be made with different colors and that serve as decorative pattern for the Tea Towel. In my project, I chose the Rose Square Motif consisting of three colors. I selected this Motif because I wanted a nice 3D flower for my Tea Towel. In previous projects, I made some Irish crochet flowers in place of buttons for the strap of the Tea Towels. This time, I would like to have the flowers on the Tea Towel itself, particularly, the upper section of the towel. I also made extra flowers to go on the back of the granny square. 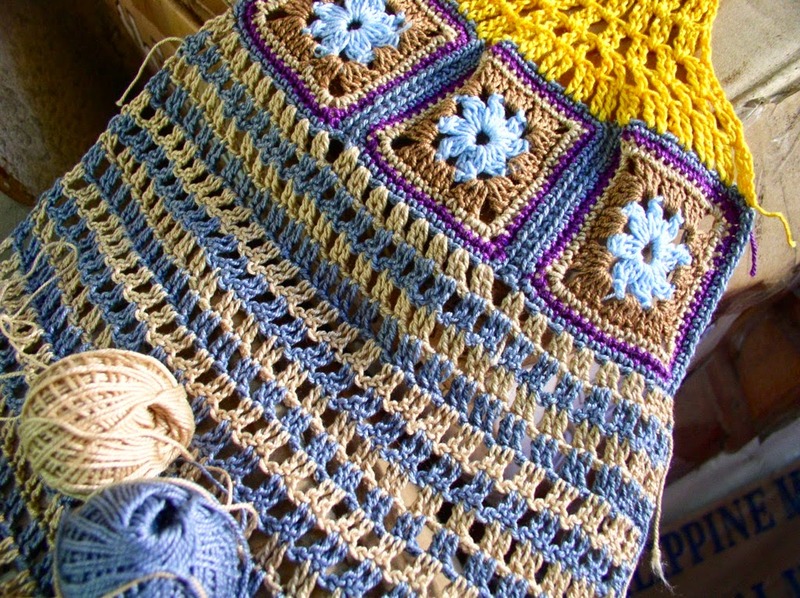 Now, look for some basic stitch patterns or close-weave patterns that can be used for the main section of the Tea Towel. Decide whether you’d like a soft or stiff towel, or a plain or textured tea towel. In my case, I wanted something soft and simple, so I used a plain (2dc, 1 ch) pattern. The strap of the Tea Towel is probably the trickiest because it will define how much your tea towel folds and how the overall appearance of the tea towel will balance out. I decided on a using a simple button for the strap. I also avoided using double crochet for the strap but chose to use treble crochet stitches so that it differentiates from the rest of the tea towel.